Governor-elect Terry Branstad this morning announced a northwest Iowa woman who has led economic development efforts in the Sioux City area for the past 15 years will serve as director of the Iowa Department of Economic Development. Debi Durham, the Republican Party’s 2002 nominee for lieutenant governor, has been president of the Siouxland Chamber of Commerce since 1995. Durham’s first job will be drawing up the plan for the new public-private partnership between state government and the Iowa business community, an entity that will replace the existing Department of Economic Development. Durham also plans to do what she called an “honest assessment” of the staffing levels in the existing agency, but she also used this morning’s news conference to send a message to the employees in the Department of Economic Development. 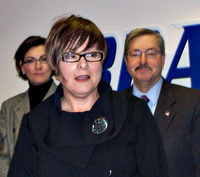 Branstad told reporters Durham was his top choice for the job. Branstad also cited Durham’s work at the local level in recruiting businesses to relocate in Sioux City, as he said while companies consider different states for expansion, the final decision hinges on a specific location. Durham has also been the leader of two other groups in the Sioux City area — The Siouxland Initiative, which is a regional economic development effort that stretches from Iowa into Nebraska and South Dakota, as well as the Siouxland Chamber Foundation.